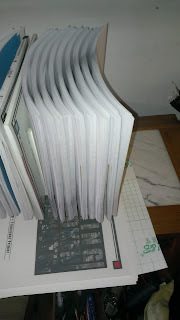 Over the years, I've printed and bound stuff in a variety of ways. Stapled zines, hand-sewn hardcovers, perfect-bound digital offset runs, and so forth all have their place. But none of these things quite fit the vision I had for the initial production of my latest work - especially given that I have little money, less popular appeal than is required to run any kind of successful crowdfunding campaign, and quite enjoy figuring out what our changing technological context has made feasible to do in my studio without too much trouble. 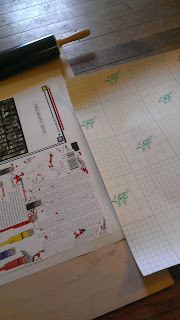 One of the biggest hurdles to printing what amount to art books at home is the serious crappification of digital printing equipment. I would gladly have come up with a thousand bucks or more to get a printer that would (a) reliably meet my quality needs, (b) didn't require prohibitively costly paper, (c) had reasonable running costs, and (d) was not engineered to catastrophically fail in less time than it would take for me to produce a quantity of salable material sufficient to pay for its purchase and maintenance. But nothing currently on the market in this price range even comes close to meeting these conditions. If all I wanted to do was sell one-off art prints, there are lots of inkjets that will pay for themselves just before the point of catastrophic failure. 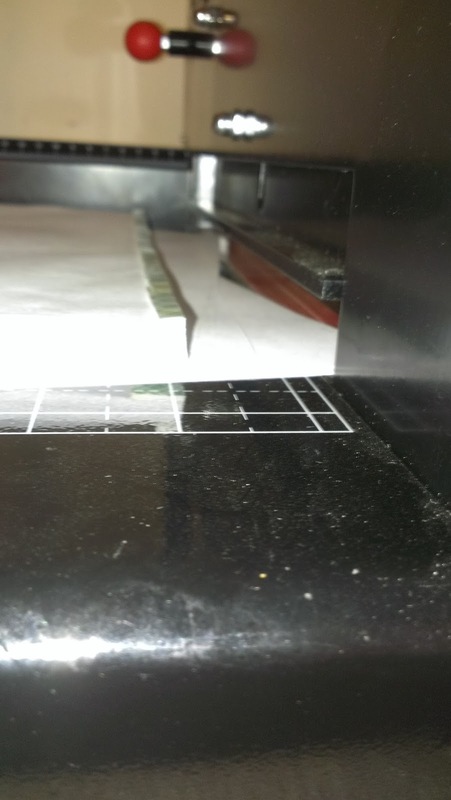 There are lasers that will do the same for black-and-white book printing. 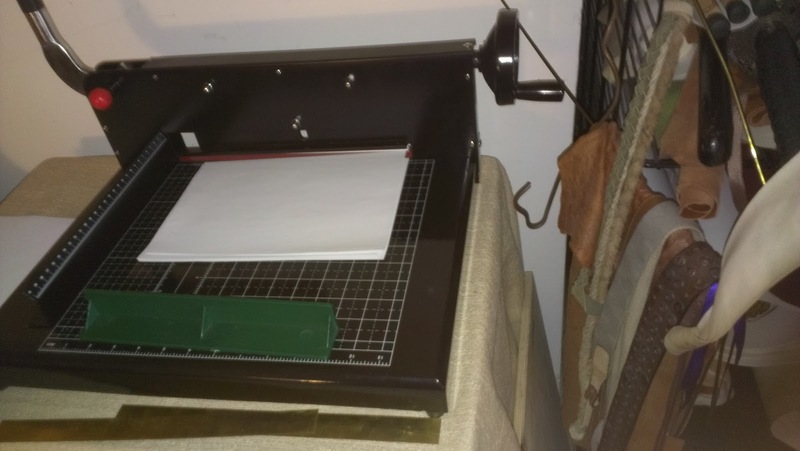 But for printing full-color books that can be sold at a reasonable price, the financial investment required (if you're willing to to buy used equipment and learn to properly maintain this) begins at about five thousand dollars. Which is more money than my yearly net income was in four out of the last five years. 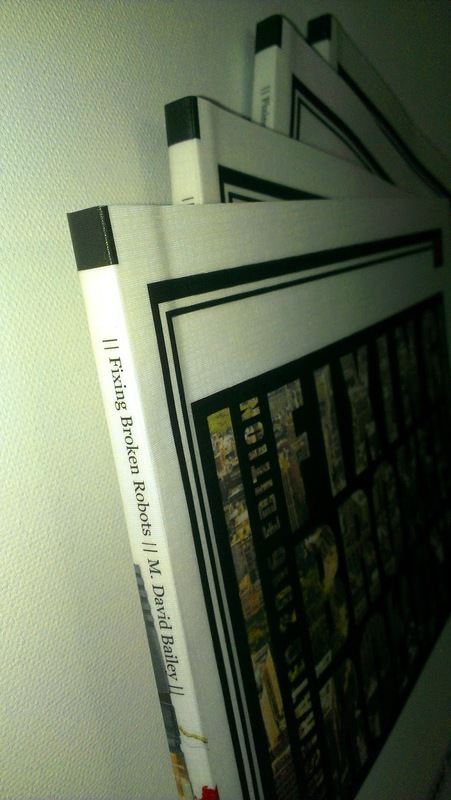 To test the limits of this undesirable reality, I went ahead and got set up to print and bind a hundred copies of my latest book. You can read about the economics of this experiment and other details on this No Shirt Press page. Below are pictures of the book manufacturing process that I came up with. Here are a few completed books. They look great (despite the lame cell phone picture) and seem very sturdy. This gives me something nifty and tangible to peddle wherever I am. 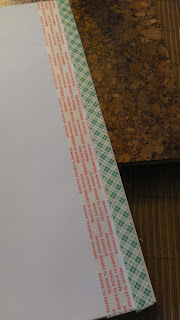 I used a rolling pin to apply a protective 3 mil textured laminate to the book covers, and a rubber roller salvaged from an old laser printer to finish off the cold-press process. 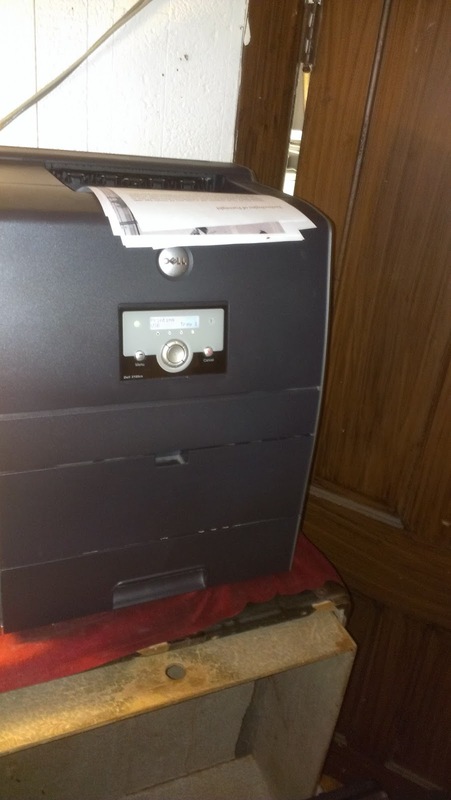 Here is the decade-old color laser printer I used to print the page blocks. It is slow and finicky, but it was affordable, the image quality is great (after slightly modifying its innards to eliminate some banding) and its running costs are not prohibitive. Here are a couple of shots of the best knock-off paper stack cutter ebay had to offer. 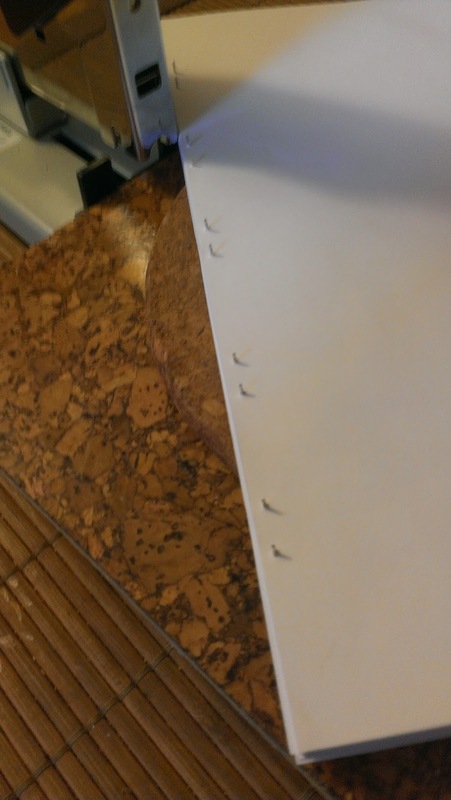 Due to the high cost of paper stack trimming as-a-service, this thing paid for itself after successfully completing just a few hundred cuts. Here are some page blocks ready to be bound. 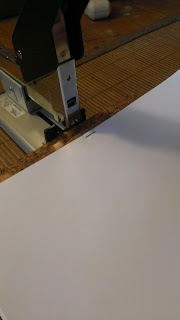 Here are some pics of stapling the page blocks with a monster stapler. In order to get desired precision, the paper rests on a maneuverable slab of cork. Staples are first closed manually with a pliers. 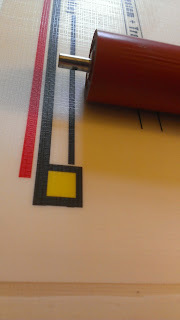 Then the stack cutter is used to perfectly flatten the row of staples and trim the block's spine to within about 3/32" (+/- 1/32") of the staple row. The covers are attached to the page blocks with two types of heavy-duty mounting tape. 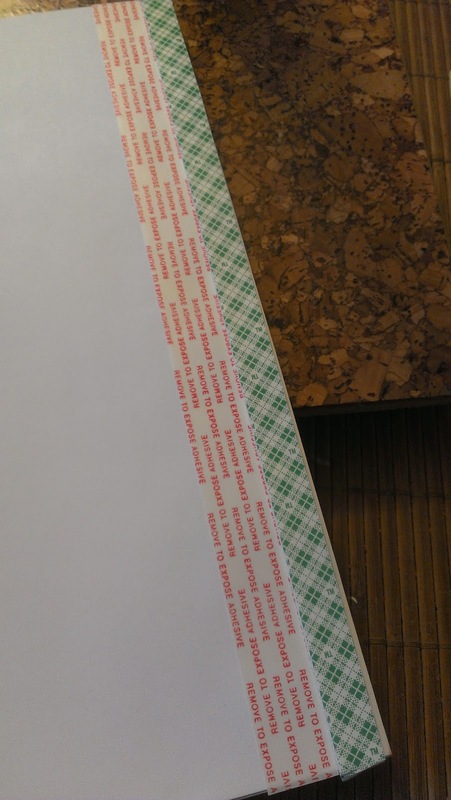 A foam tape evens out the slight unevenness created by the row of staples, while a wider, thinner tape flexibly bonds the laminated book covers to blank end sheets on both sides of the page blocks.